Thinking of going to Tacoma and it’s a Tuesday, save yourself frustration and forget about it. Tacoma closes on Tuesday. Major attractions lock the doors and disappear. One has to wonder who is the mastermind that decided everyone should close on the same day. How does that benefit anyone? On previous trips to Tacoma we’ve visited four of the five museums and would love to revisit each of them. 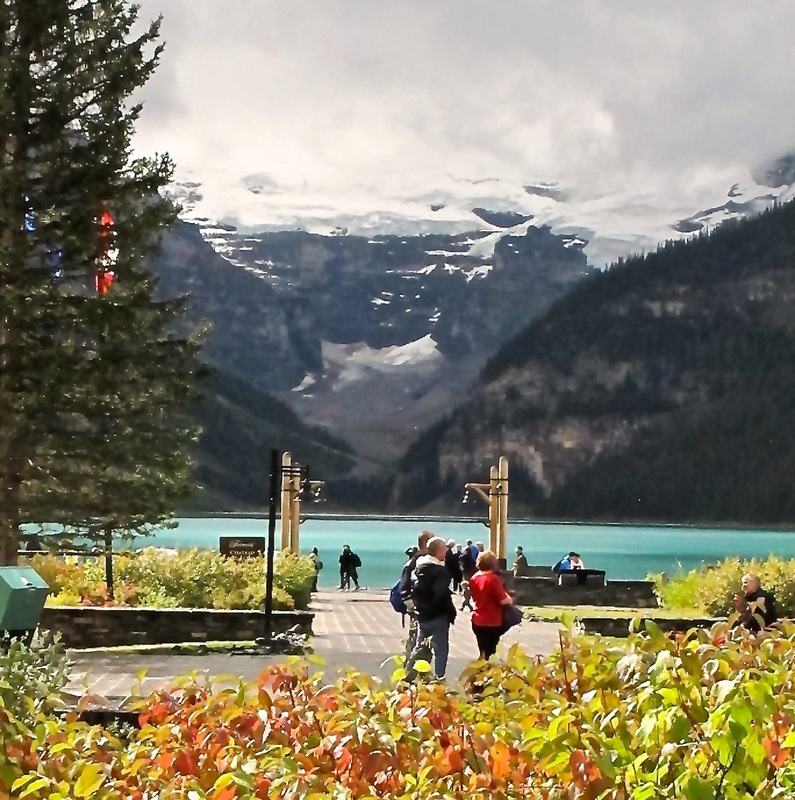 These sites offer quality experiences – just, NOT on Tuesday. It’s not like this is a single staff or even one association running the five facilities; it’s beyond my comprehension why anyone wants to see all these attractions closed on the same day. The only power the traveler has is to take their tourism dollar and leave town. Exactly what we did. 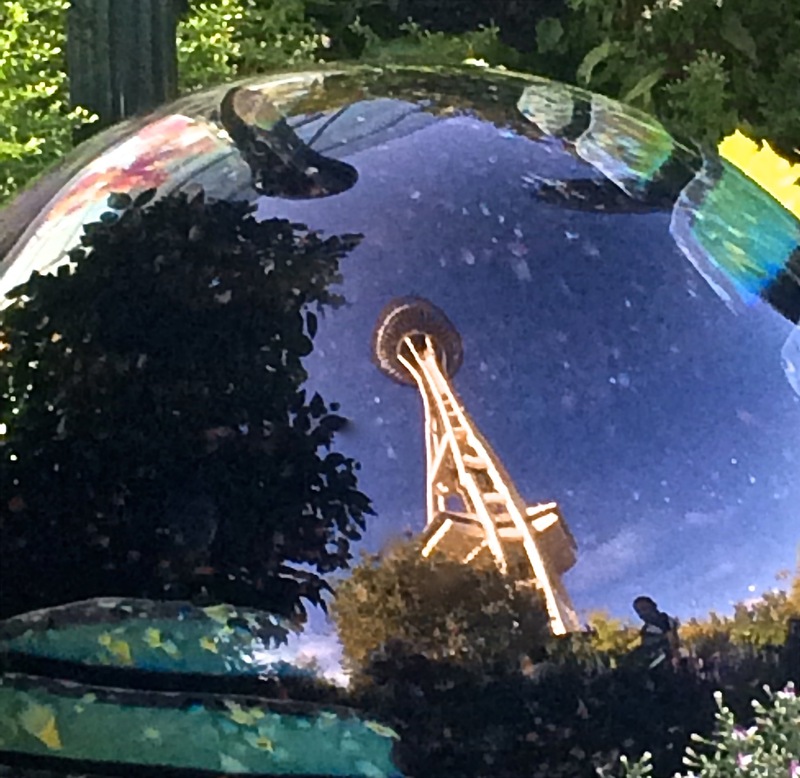 Today was the day to fulfill a primary purpose of the entire trip – to experience the Chihuly Garden and Glass Exhibition in Seattle. We were not disappointed, even better than anticipated. Many elements of the site deserve more time and space than I have energy for tonight. Therefore just a few photos to provide an overview. Hopefully there will be a time when I share more from an outstanding day. 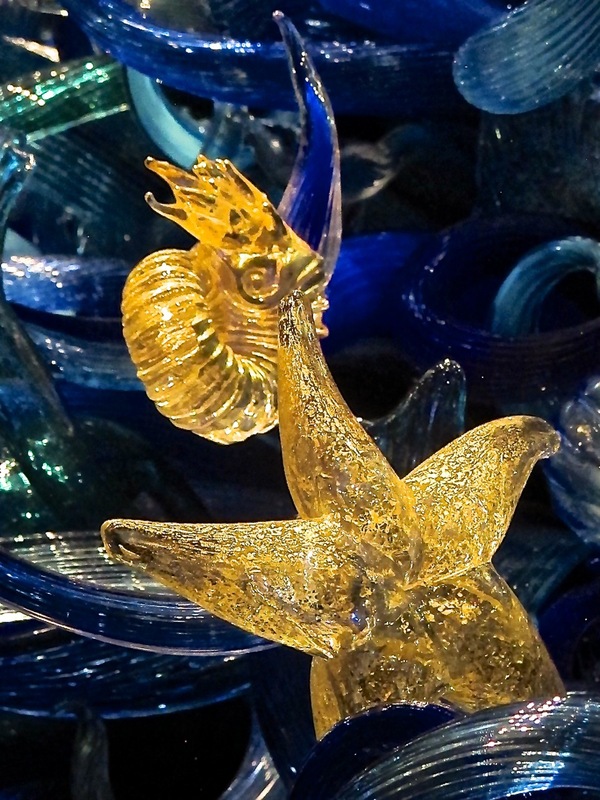 My new favorite Chihuly installation is the Sealife Tower. Golden glass sea forms float in the massive blue tower. Stunning. The longer I circled and observed the more enchanted I became. 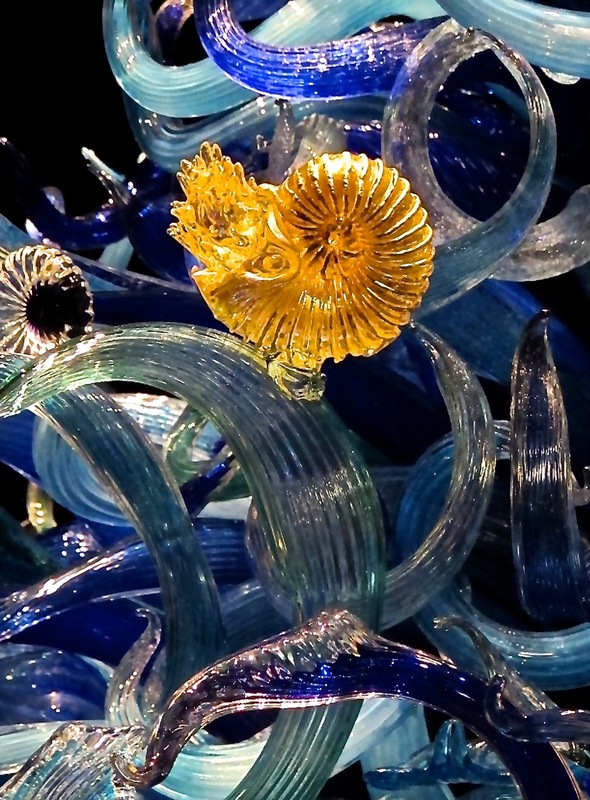 Eight indoor galleries present the wide variety of Chihuly’s creations. Glass Forest, Norhtwest Room, Sealife Room, Persian Ceilng, Mille Fiori, Ikebana and Float Boat, Chandeliers, Macchia Forest – none should be missed. 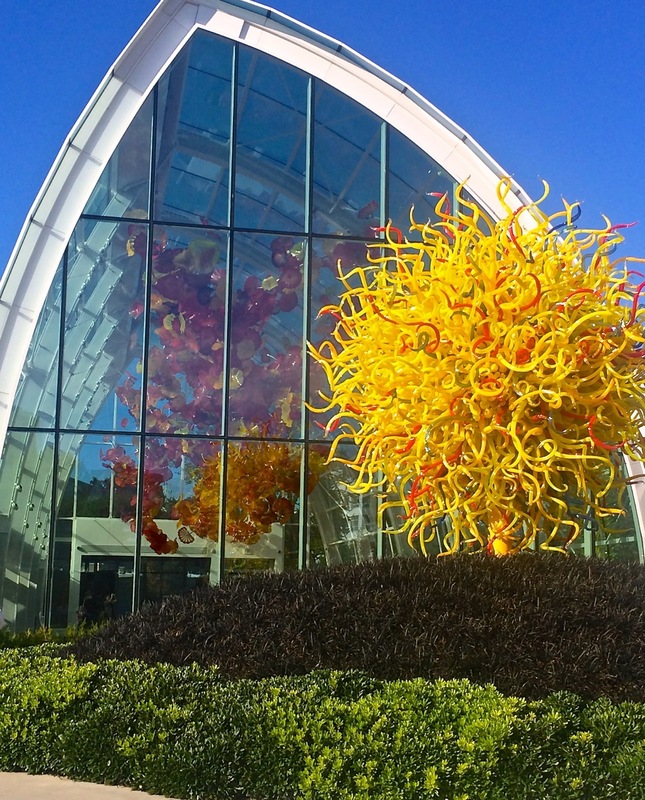 A number of glass conservatories around the world have hosted temporary Chihuly exhibitions. For Seattle’s Garden and Glass he designed his own glasshouse. 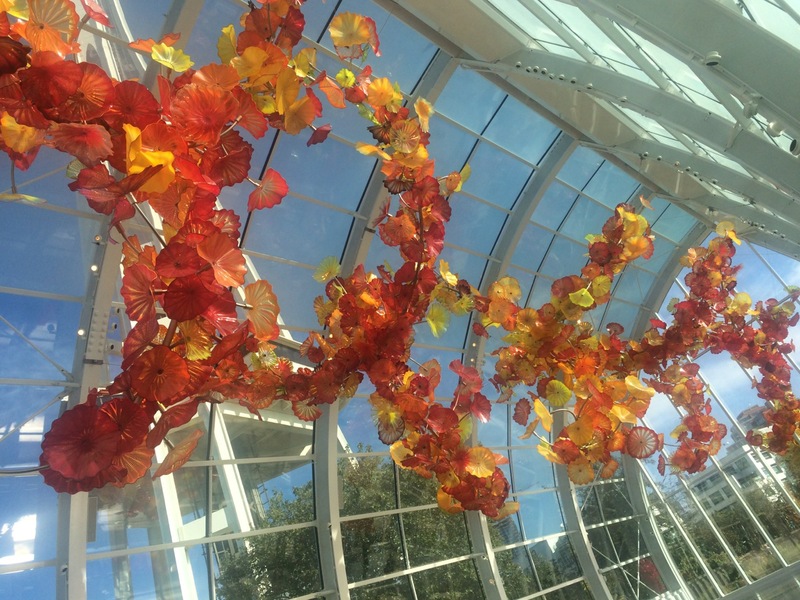 A 100-foot long suspended glass sculpture stretches across the top of the 40-foot tall room. The 605-foot Space Needle looks down on the outdoor garden installations. At the right time of day reflections of the Needle appear in many of the glass orbs in fascinating juxtapositions. 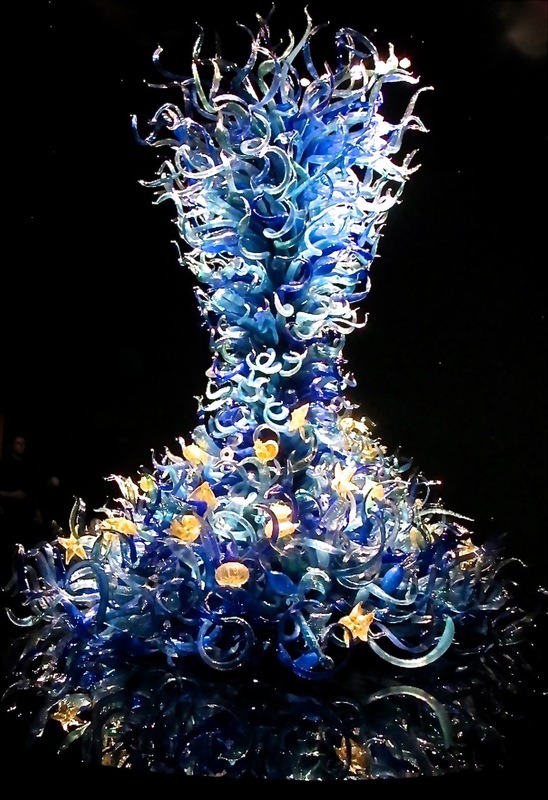 After viewing just a few amateur photographs I hope you agree that the Chihuly Garden and Class is well worth a trip to Seattle. 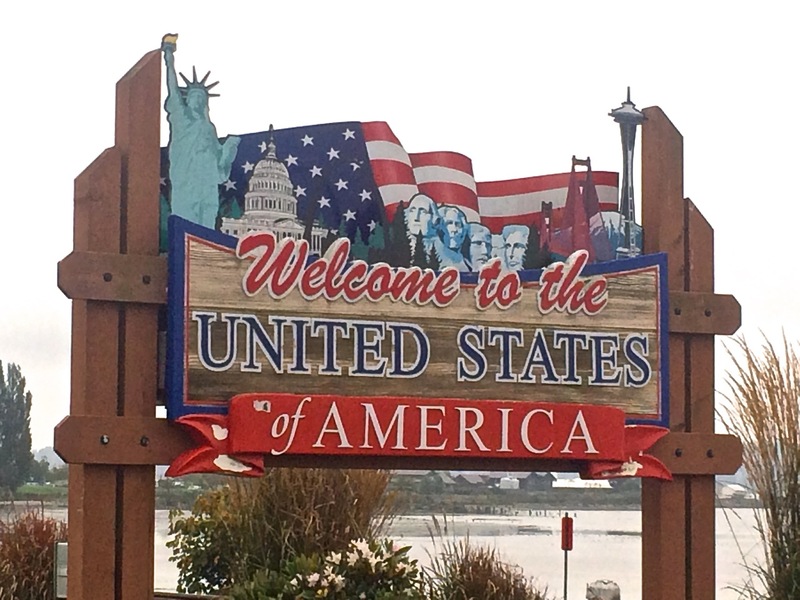 Depending on your view, the good news – or bad news – is that they let us back into the country. 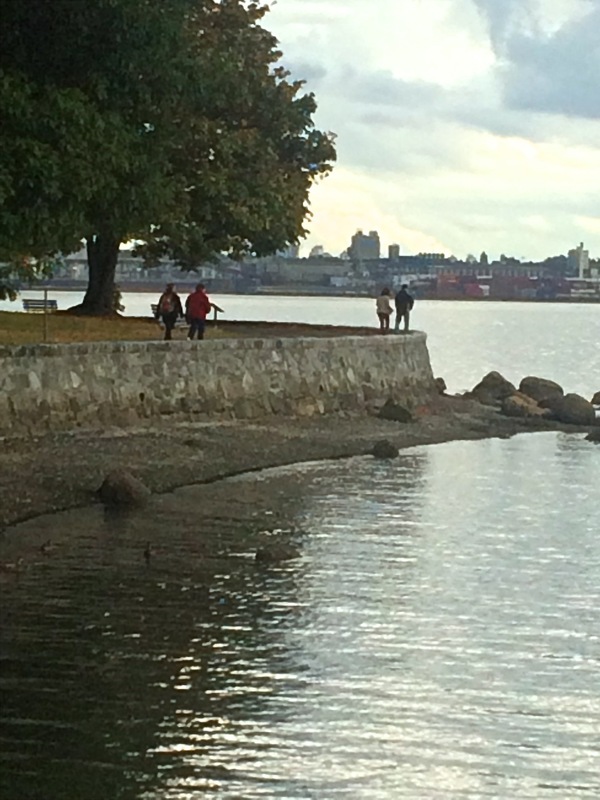 After an 80 minute wait at the Peace Arch Crossing at White Rock, BC/Blaine, WA we were once again on our way. There was plenty of time for a little ironic political thinking of the roadblocks for citizens to be admitted when our borders are open sieves for illegal entries and terrorists because we wouldn’t want to hurt anyone’s feelings. Yet the tax paying, legal, upright citizen is given the third degree. Why doesn’t someone call that profiling? We spent the afternoon and evening visiting with Bob’s cousin Walt and his wife Ann, a delight to see them again after many years. We enjoyed lunch in their home and an outstanding dinner at Oyster Bar Restaurant south of Bellingham. 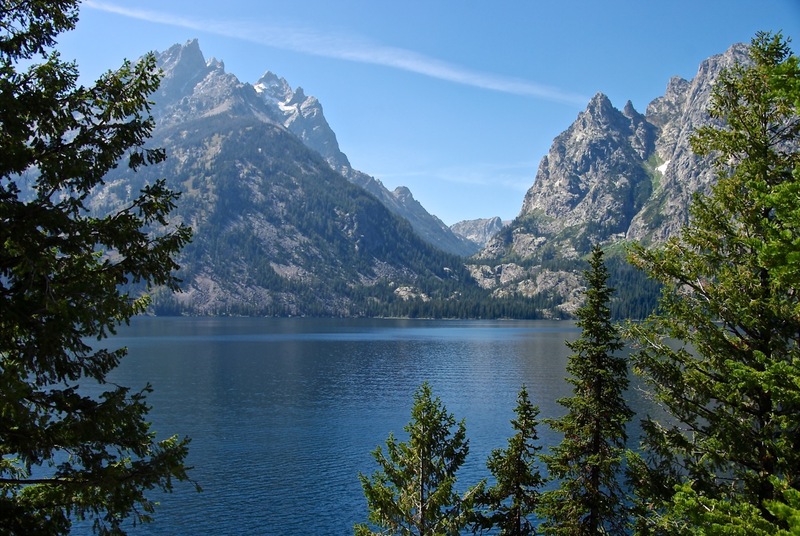 The drive south on the old road right along the water was marvelous – narrow and winding but very scenic. 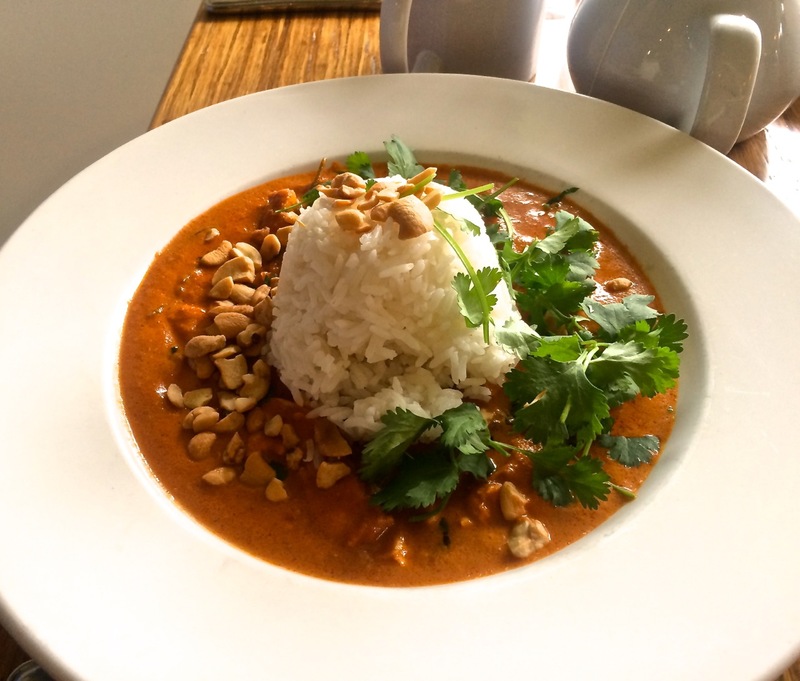 Dinner is worthy of an entire story. For now, let’s just say the best meal with the best view and company we’ve had on the entire trip. 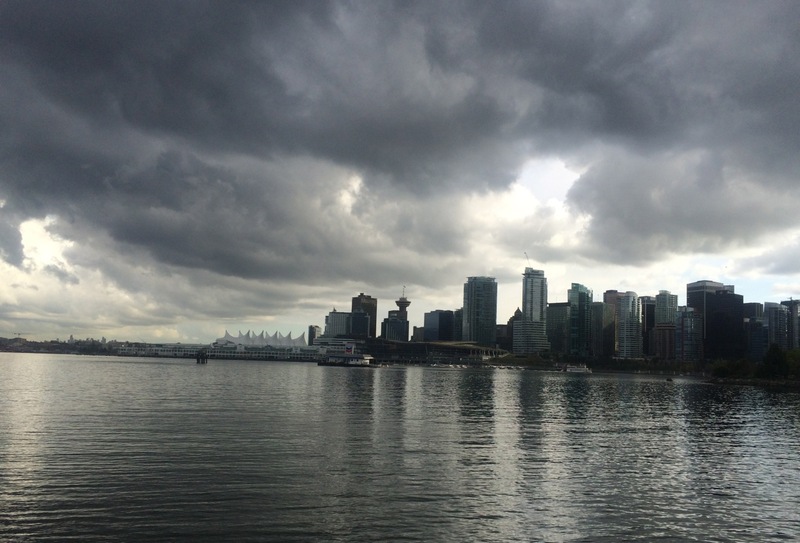 Although the day started with clouds and rain, we’re in Vancouver, get out and participate. 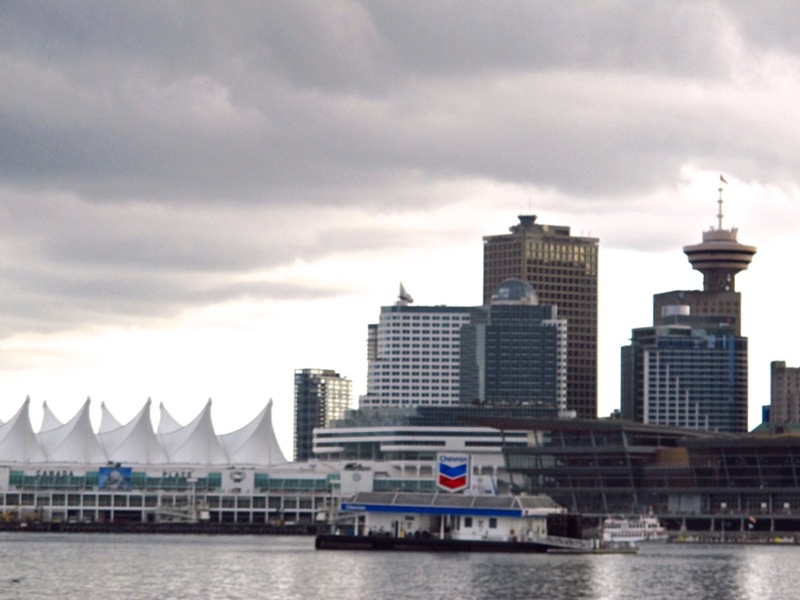 This is a city of walkers and outdoor activities, a little rain is barely noticed. 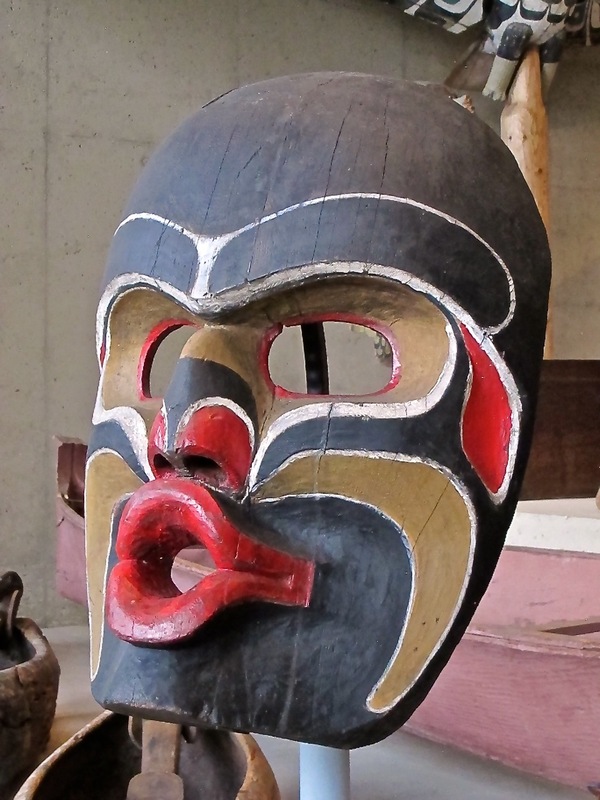 After a drive through Stanley Park and along English Bay we spent several hours at the University of British Columbia’s Museum of Anthropogy – a treasure trove of art and artifacts of First Nation peoples. 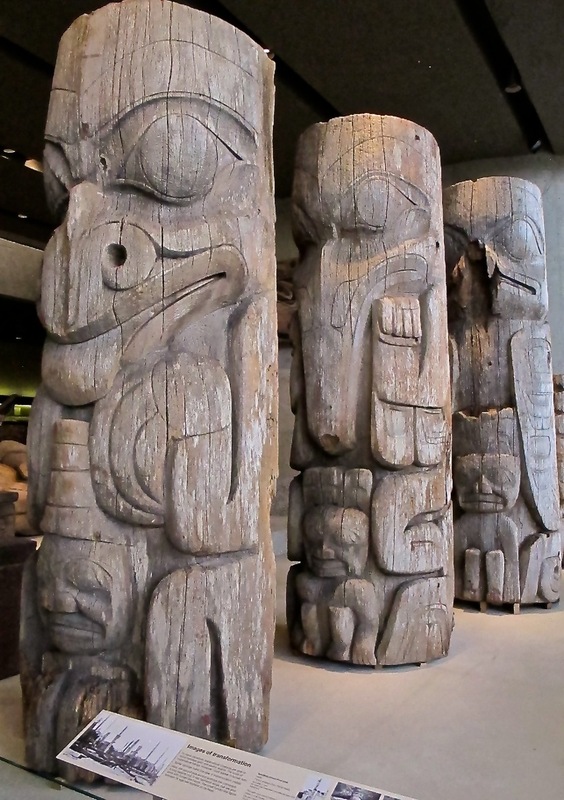 Bob is especially interested in the carvings of totems, house boards, masks, boxes, canoes. Timing was just right for me to join one of the free tour groups while Bob took detailed photos. Although we’ve been interested in Northwest Coast art and culture for decades I learned a great deal from the knowledgable, energetic guide. 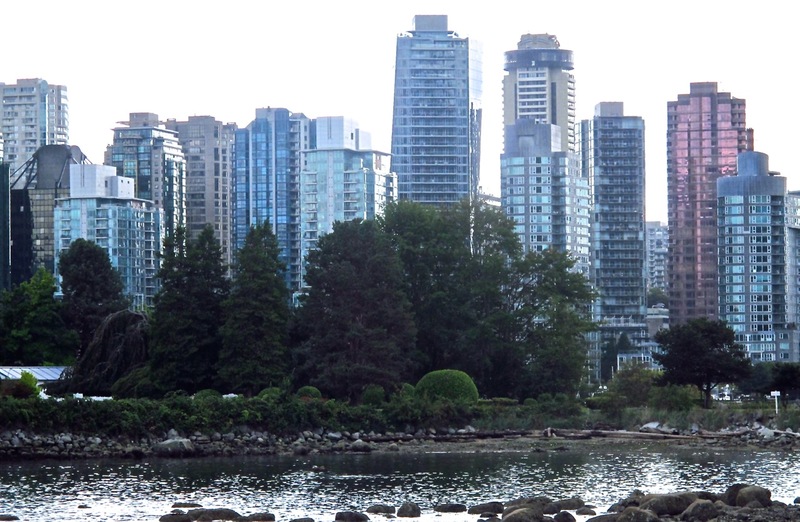 We needed a respite after museum time and headed back to Stanley Park for a mid-afternoon lunch at The Fish House restaurant. The calm ambience and seafood was greatly appreciated. 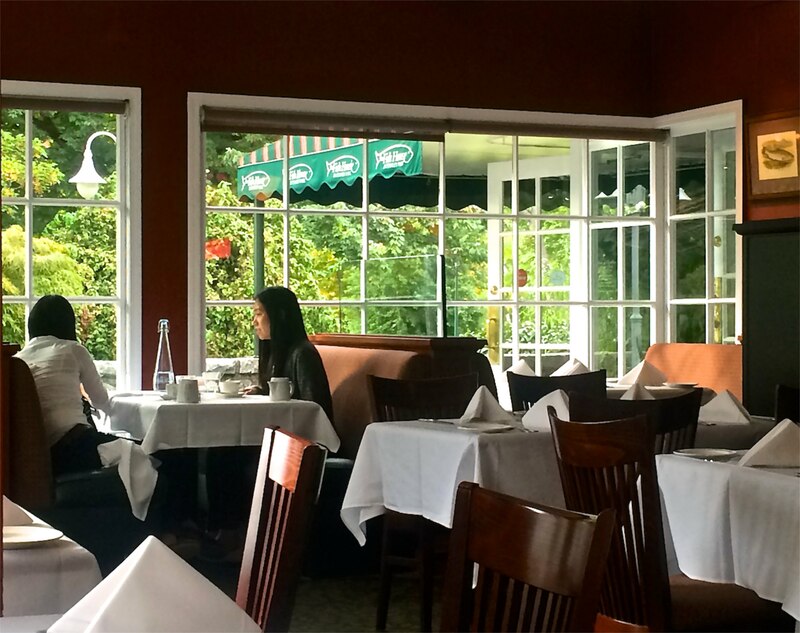 We noted that in addition to lunch and dinner the restaurant serves afternoon tea as well. 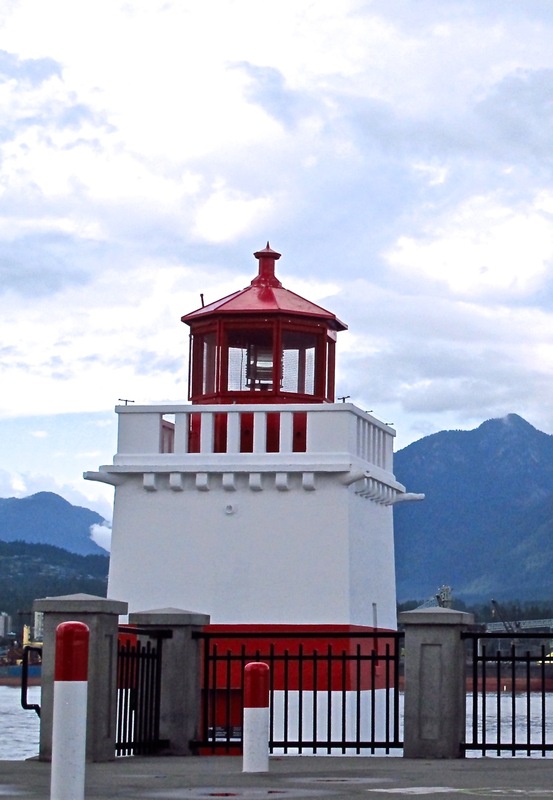 The rest of the afternoon was spent at sites in the park – totem poles, lighthouse, dense forests and walks along the sea wall. Throughout the day we were encouraged by sun breaks and patches of blue skies. We even found the clouds photographic. 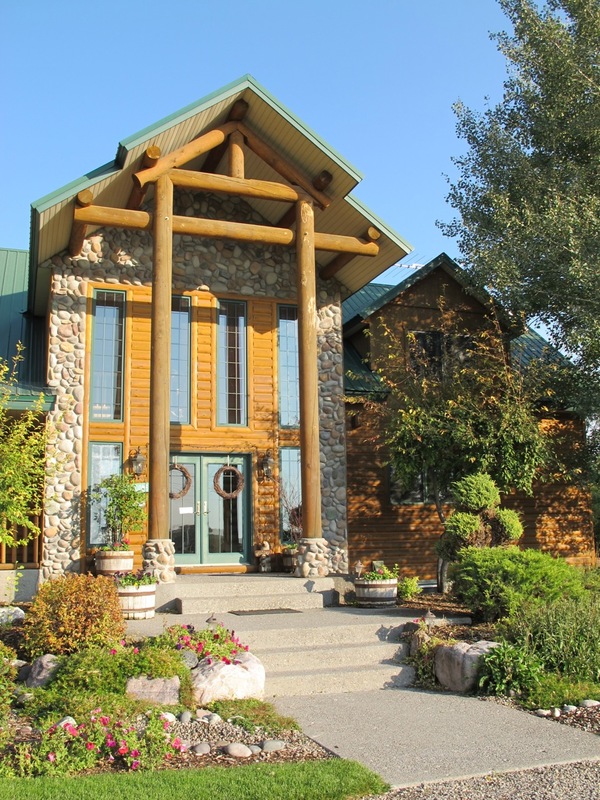 While traveling the Crowsnest Highway between the Okanagan Valley and Vancouver today I had to make a u-turn and backtrack to Parsons Farm Market in Keremeos, British Columbia. The area is known as the farm stand capital of BC and we had passed numerous stands but Parsons demanded a closer look. Established in 1908 and one of the first family operations to open a farm market Parsons is now overseen by the fourth generation. 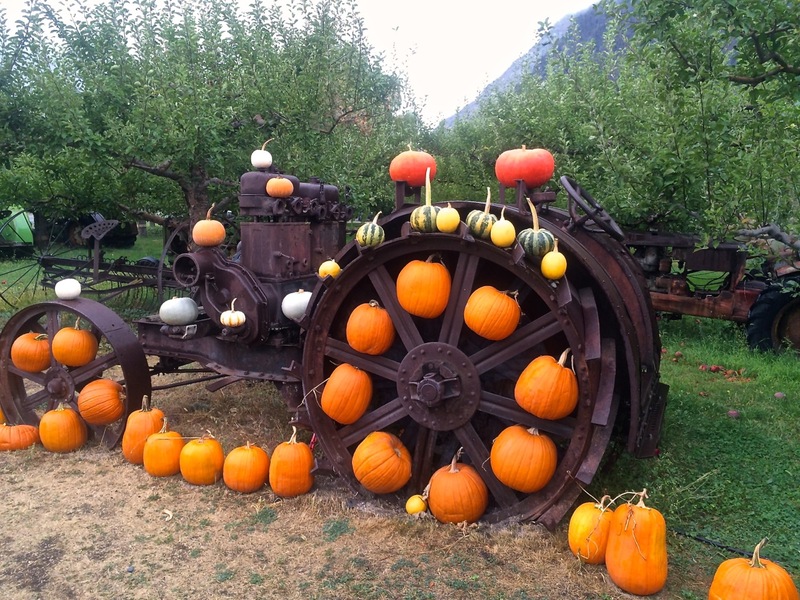 A collection of antique tractors stand adorned with a fall harvest of pumpkins, squashes and gourds. 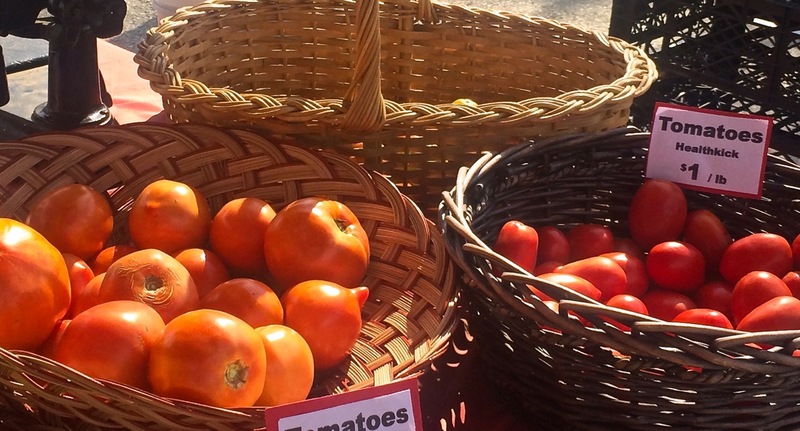 Large bins hold a rich harvest of tomatoes and apples. 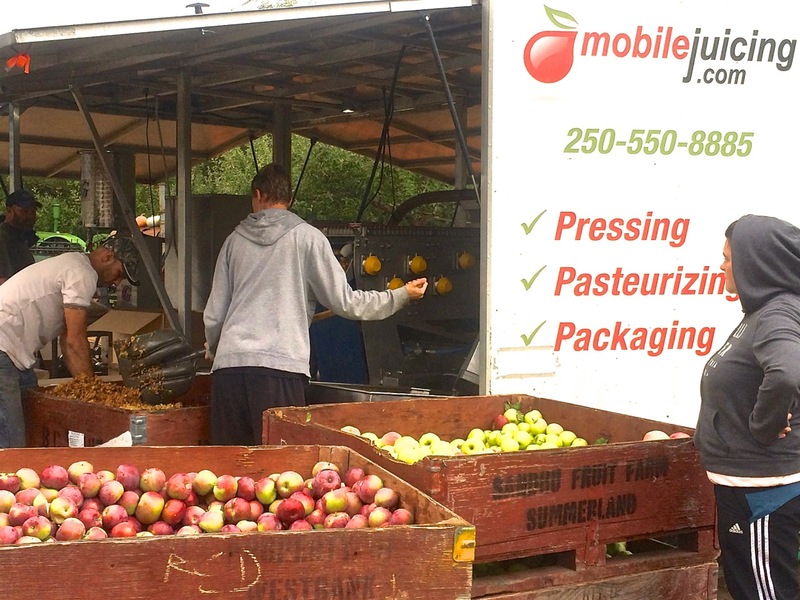 A mobile juicing unit is at Parsons today quickly turning shovelfuls of apples into juice. 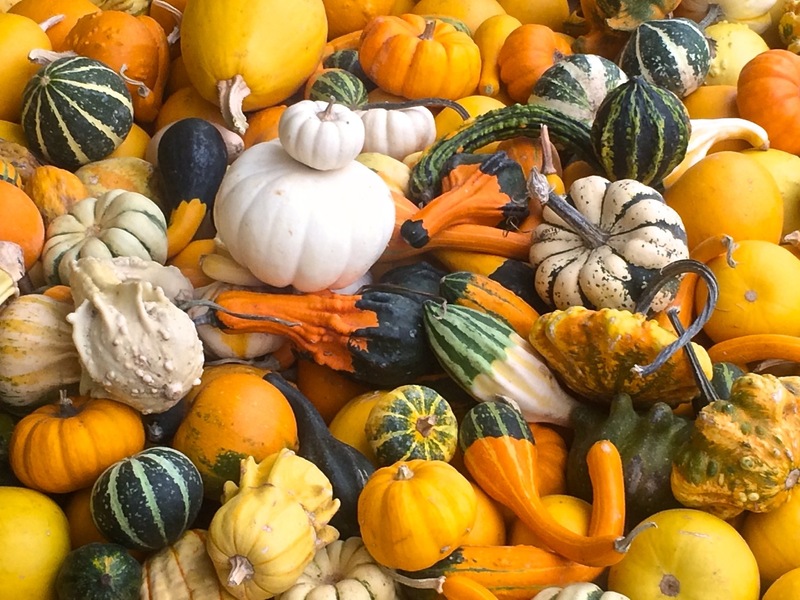 While the decorations are eye-catching the produce is very appealing, if we weren’t on the road for a couple of more weeks I’d be loading up on all sorts of fruits and veggies. 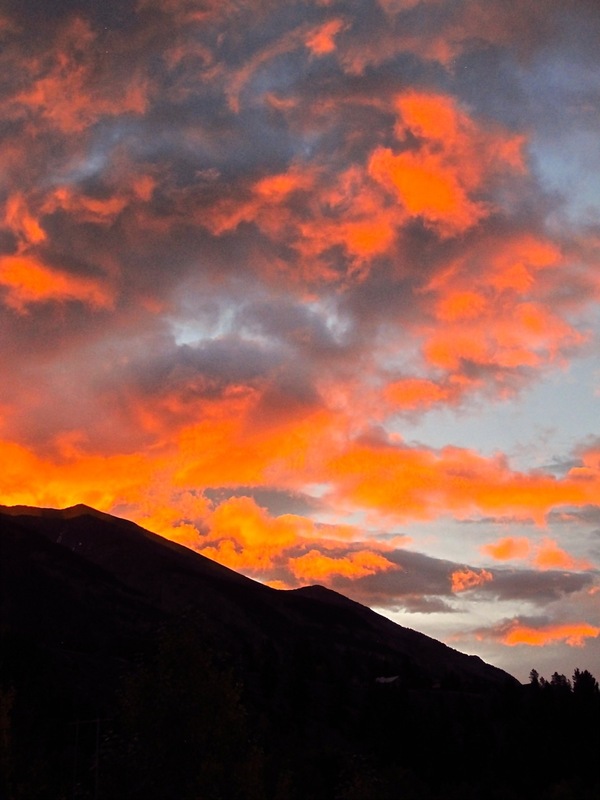 I share a slideshow of some of my favorite pictures from our brief stop in Keremeos. 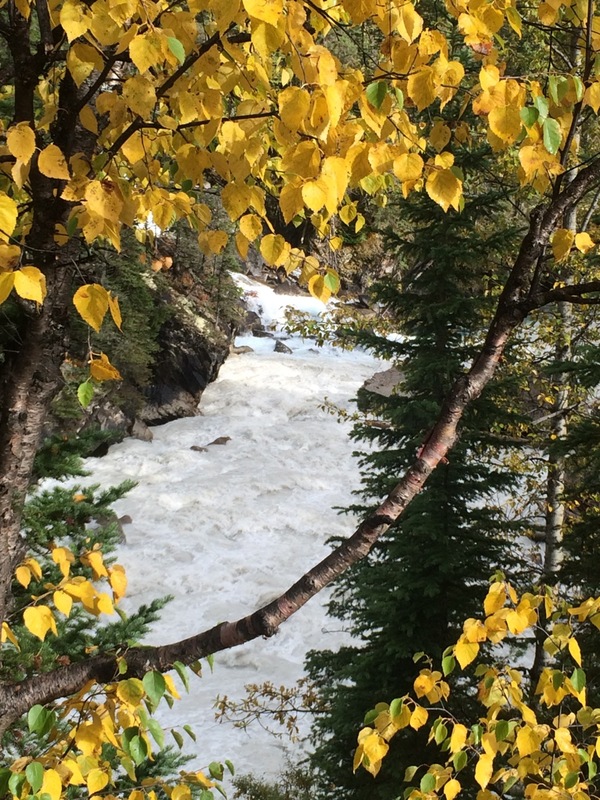 Please take a couple of minutes and enjoy scenes of autumn that will surely put a smile on your face. With Penticton, British Columbia as home base we explored a small portion of the Okanagan Valley today. Acres upon acres of fruit trees and tidy rows of grape vines stretch across the landscape. 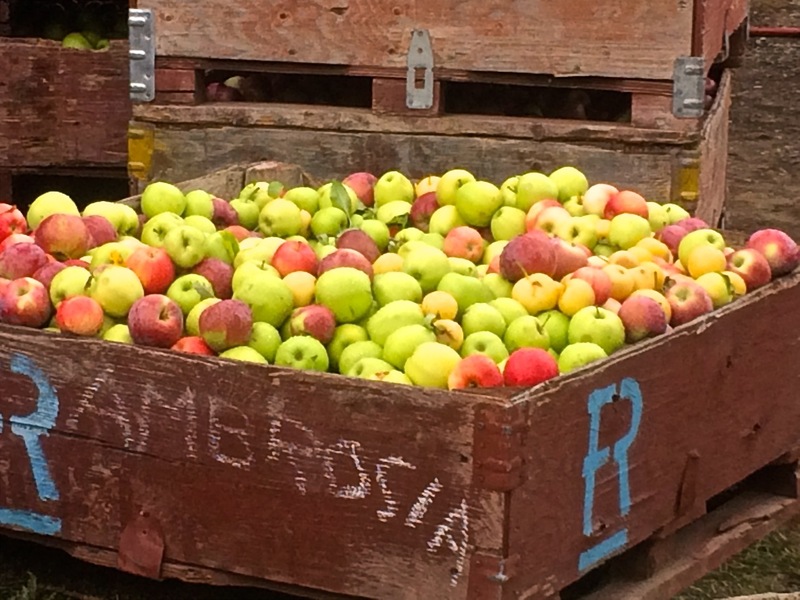 Large red and golden apples await pickers and wine grapes swell with juice. Such a great location for a relaxed day of wandering back roads, tastings and photos – even if there were clouds and afternoon showers. 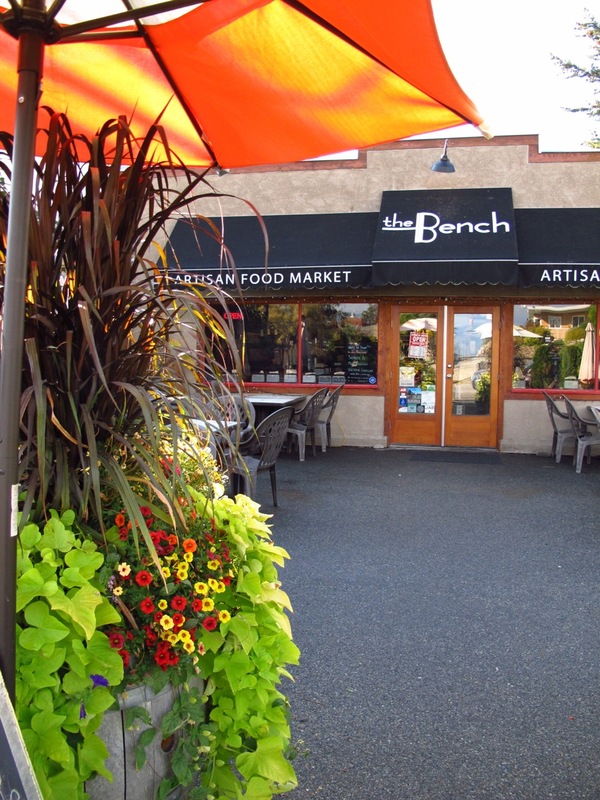 Our day started at The Bench, a charming little artisan cafe and market a short walking distance from our lodging. A steady stream of locals stopped for morning coffee and conversation. We ordered “Eggers” (much like an egg McMuffin – only better) with a Dijon Mayo spread. Bob selected one with smoked salmon and capers, I chose bacon. We shared a raspberry-nectarine scone made with fresh fruit. Yum, good start to the day. We headed north along the west side of Okanagan Lake making a stop at the local farmers market in Summerland to purchase fresh pears and plums for an afternoon snack with cheese and crackers. 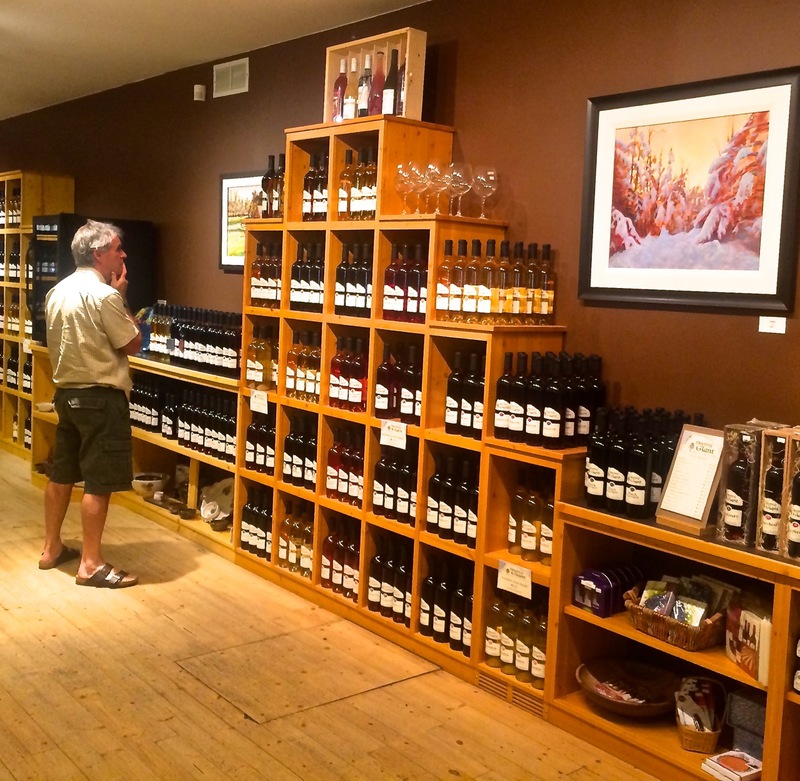 A helpful lady at the local visitor center steered us to Summerland Sweets and Sleeping Giant Winery a few miles outside of town. All over Western Canada gift shops and stores sell the jams, syrups and jellies (candies) made here at Summerland Sweets. A first for us was the syrup tasting station. 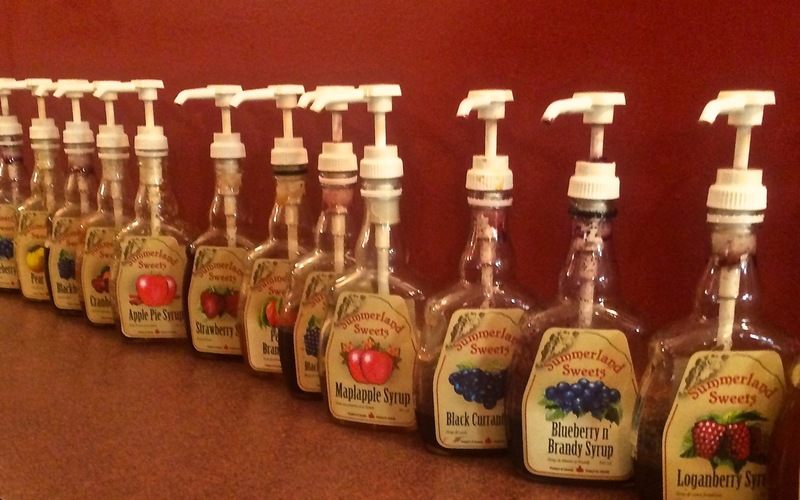 With more than 20 syrups to choose from being able to taste before selection is a real bonus. I liked the Maplapple, Bob’s favorite was the Black Currant, we both agreed the pear was outstanding. Since this is a road trip we’re taking home quite a selection. 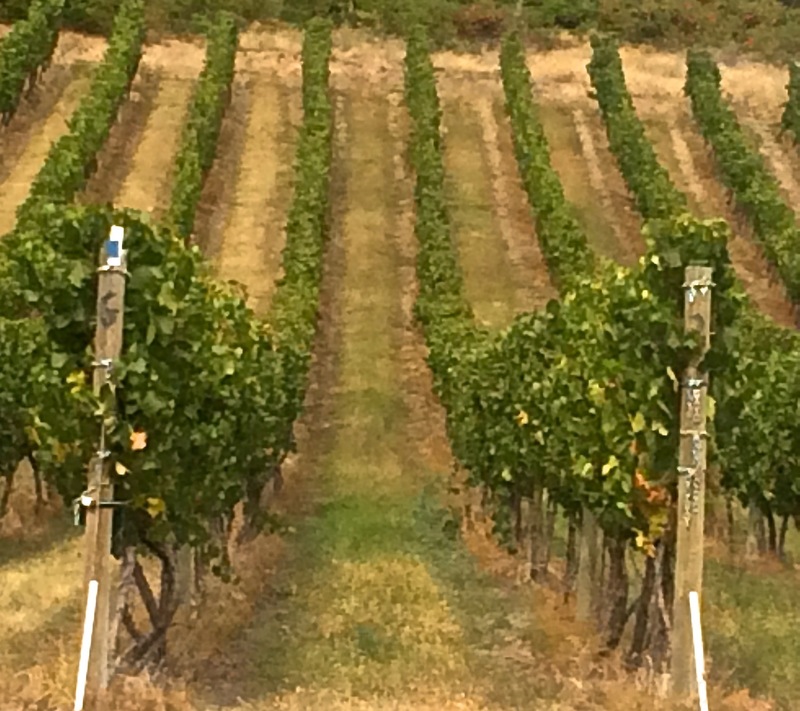 The adjacent Sleeping Giant winery produces fruit wines, everything but grapes. From the long list we select five to try. Many are sweeter than normal table wines but some like the pear are dry and crisp. Peach is one of their top sellers and certainly gives off the distinctive peachy aroma. I note that a number of customers come in to purchase, knowing exactly what they’re after, obviously very familiar with the selection. To cap our tasting we try the seasonal pumpkin wine with the spicy flavors of clove, nutmeg and cinnamon. Our Thanksgiving guests will be greeted with mulled pumpkin wine this year. 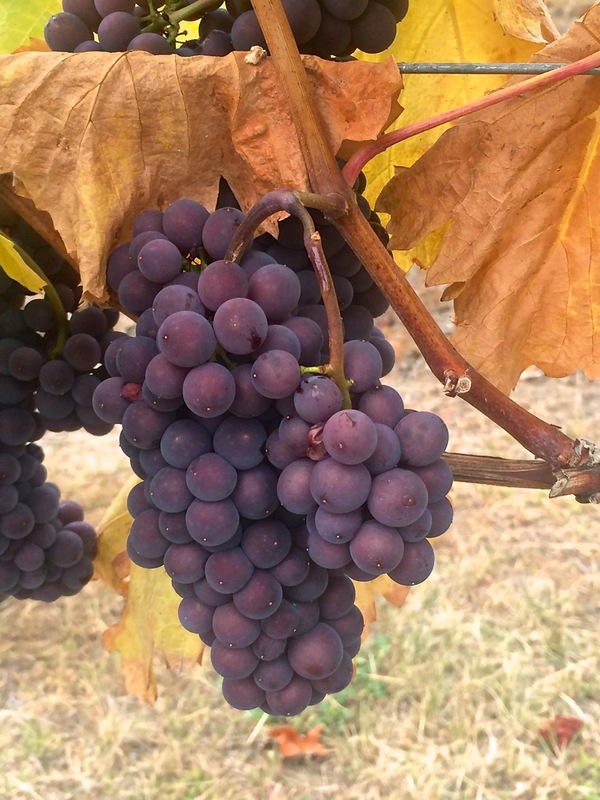 There are so many wineries in the region it’s hard to know which ones to select. On our first visit to the valley I chose by the more interesting names – Blasted Church, Black Widow, Laughing Stock, Therapy, Forbidden Fruit. 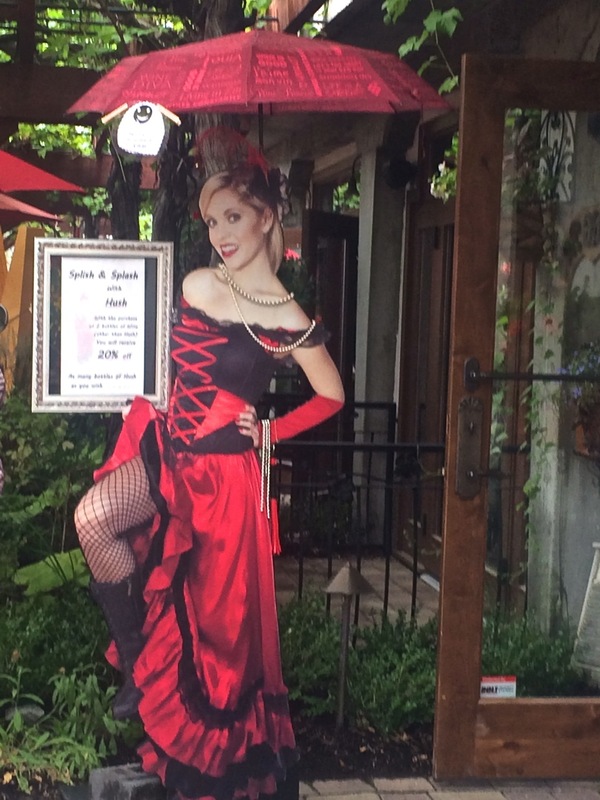 How can one not wonder about a winery named Dirty Laundry? 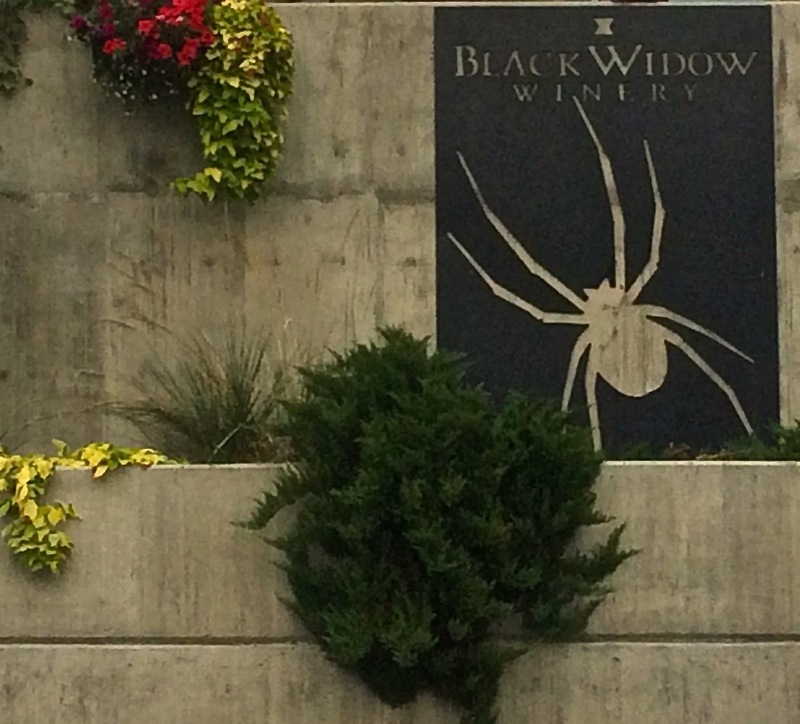 I remember taking home their Gewürztraminer. They’ve added a new tasting room and patio since our last visit. After tasting three different Gewuztraminers I select two for purchase. One of the wines won a North American award this year but at this point in the tastings I don’t remember the details. Tasters also hear the local legion of the Dirty Laundry name. We spent the rest of the afternoon visiting a farm stand and driving up the east side of the lake to the village of Naramata. I don’t think one can go a mile without a sign directing you to a winery, artist studio or an artisan cheese maker. I need a week to explore this section of the Okanagan.